Celebrating the life of Herbert A. Budd, Jr.
Obituary for Herbert A. Budd, Jr.
Herbert A. Budd, Jr., 82 died Friday, Feb. 8 at Manor Care, Washington Twp. with his family by his side. Herb is predeceased by his parents, Herbert A. Budd Sr. and Lillian Sheldon. Beloved husband of 62 years to Phyllis G. Budd (nee Geisler). Devoted Father of Randy (Donna) Budd, Wanda (Ken) McIlvaine, & Donalee (Jim) Boyd. Grandfather of Dana (Chris) Volk, Kimmie (Gene) Cuneo, Brian (Natalie) Boyd, Anthony Yula III, Randi (Christian) Gatti, David (Desiree) Boyd, Jamie (Sam) Salib and the late Christie Lee Yula. Great Grandfather of 14, Brother of Charles “Cabby” (Jackie) Budd and Dreana Lydic. Herb graduated from Woodbury High School in 1954. A true entrepreneur, Herb was the founder of Budd’s Pools in 1958 and of many other businesses in South Jersey. He also held a NJ Real Estate License for over 30 years, most recently with Budd Realty. He was a member of many professional and community organizations and a devoted volunteer. 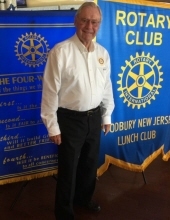 Herb was Past President of the National Swimming Pool Institute, Past District Governor of Rotary District #764 (1989-1990) and Past President Woodbury Lunch Rotary where he was member of for over 50 years. He was a 32nd Degree Mason with Florence Lodge #87 Woodbury and a member of the Shriners. Herb was a devoted member of St. Stephen’s Lutheran Church where he served as past President of the St. Stephen’s Lutheran Church Council. Friends may greet the family on Saturday, February 16, 2019 after 9:30am in St. Stephen’s Lutheran Church, 230 N. Evergreen Ave, Woodbury, NJ 08096. Funeral service will be at 11:30am. Interment Eglington Cemetery. In Lieu of Flowers, donations may be made to St. Stephen’s Lutheran Church at the above address, the Parkinson’s Foundation at www.parkinson.org/ or to Woodbury Rotary Club, PO Box 261, Woodbury, NJ 08096. Memories may be shared atwww.buddfuneralhome.com. To send flowers or a remembrance gift to the family of Herbert A. Budd, Jr., please visit our Tribute Store. "Email Address" would like to share the life celebration of Herbert A. Budd, Jr.. Click on the "link" to go to share a favorite memory or leave a condolence message for the family.